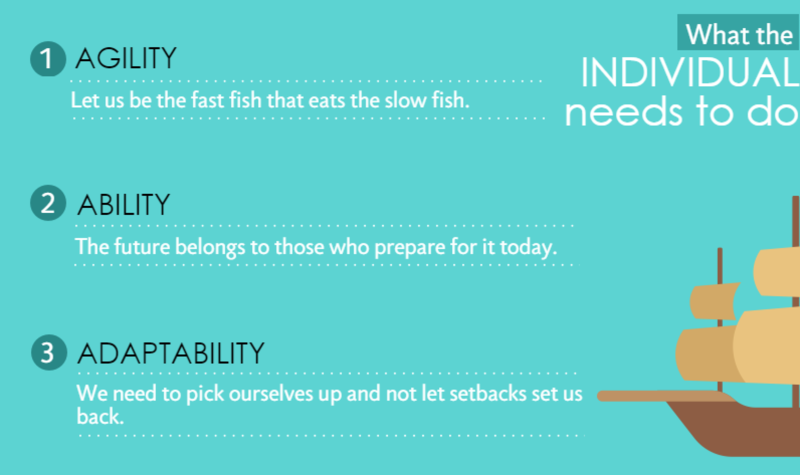 It’s the start of brand new year, and given the storm that 2016 brought upon us, most of our personal resolutions would have been to make ourselves stronger, more competitive and basically more geared up for survival in the coming year. But what about our work resolutions? The recurring theme of 2016 was ‘disruption’, and while our economy had reported a “faster-than-expected” 1.8% expansion in the last 3 months of 2016, this piece of good news was taken with a large pinch of salt by Nomura economist Brian Tan, who described the numbers as “a bit too good to be true”. 2017 may not overwrite any of the problems we were facing in 2016 – retrenchment, unemployment and redundancy are still going to be at the back of all our minds, and these won’t disappear if we were to simply hide and wait for the storm to pass. This is an opportunity for the whole country to work together to collectively overcome storm clouds ahead. In a blog entry, Patrick Tay, who heads the Future Jobs, Skills and Training Department in NTUC, puts into perspective what 2017 has in store for us and what ‘resolutions’ all of us – the Government included – should be taking on in 2017. In the post, Tay suggests that there would be 5 global factors that we would need to keep a close watch on (not in order of emphasis): (i) Oil prices, (ii) USA’s political and economic agenda; (iii) the future direction of the European Union; (iv) the Brexit journey and (v) Asia’s growth strategy (in particular China). Given that Singapore heavily relies on trade and foreign investment, we are all the more vulnerable to the change in tides that these factors would bring about. In the local context, the similar problems that plagued us last year are still existent, and will only become more pervasive with the rise of new technology. Shortsightedly halting the development of disruptive technology to wait for everyone to catch up isn’t an option either. Identifying a phenomenon of what he calls a “‘slow-burn’ or ‘churn'” in sectors like oil and gas, offshore and marine, foreign financial institutions, and retail, 2017 will only prove to be an even rockier year for these industries locally. Overcoming the gargantuan odds will not just be about a single group of individuals doing all the work – it will need to be a collaborative effort, one that spans across job scopes, ranks and age. In a way, there’s a need to set a nationwide new year resolution, and it would be one we won’t have the luxury to ruminate sadly upon at the end of the year (like our other personal resolutions). The Labour Movement has been really busy these few years, and it looks like they’re not going to get any freer if 2016 was anything to go by. 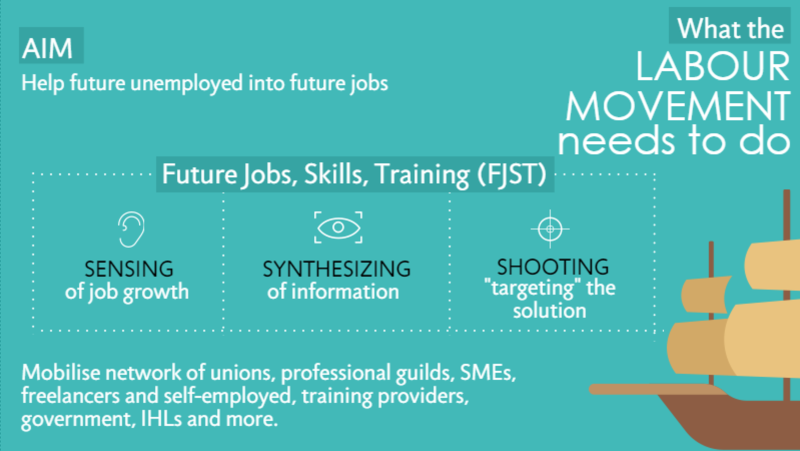 Not just helping those currently unemployed into available jobs, the focus will be on helping the ‘future unemployed’ take on ‘future jobs’ – one of the main goals of the newly-launched Future Jobs, Skills, Training (FJST) capability. The team will identify areas with high growth potential and work with institutions to formulate training programmes which will help workers fill the skills gap required for these future jobs. Tay also pointed out 3 main ways that the Government could work in tandem with the efforts by the Labour Movement. First of all, help workers who have intentions to attend SkillsFuture courses by increasing the support for companies by funding their training leave. 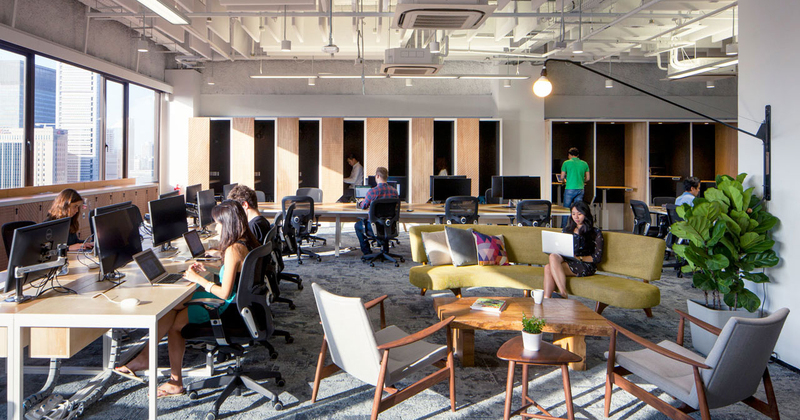 There’s a plethora of programmes available, but some of them might be held during office hours, so by providing a leeway for individuals to take up new skills without sacrificing their annual leave, there will be a double win for both employees and employers in the long run. Lastly, there should be sharing of information amongst the Tripartite partners so everyone can identify trends and solutions better. 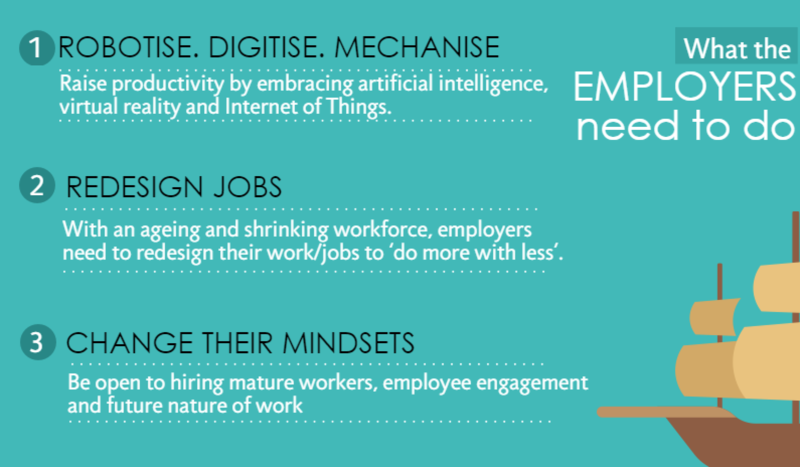 Like we’ve mentioned before, ignoring disruptive technology is plain shortsighted, and employers should instead embrace these methods of making previously tedious processes more efficient, and in turn, helping employees help themselves to become more productive with these ‘newcomers’. This is all the more pressing in the face of an ageing and shrinking workforce, and going forth, the mantra for work should be to eventually ‘do more with less’. However, all these efforts would be for naught if mindsets don’t change, and employers would need to learn how to be more inclusive of all workers and open to new work natures. Nothing much will happen if we don’t help ourselves right? With different types of jobs and job arrangements gaining relevance in today’s world, society’s mindset can sometimes be too old-fashioned towards what makes a good career, good employee and good qualities for jobseekers to have. Let’s make that change towards being more open-minded to valuing different types of careers, ages and qualities a person has. We’re already into the second week of the year, and there’s no better time to get started on these than now. While we can’t control nationwide policies or disrupt the disruptions, we can learn how to ride the waves instead of drowning in them. The Labour Movement wants to help Singaporeans get good jobs in future, and how everyone: the Labour Movement, government, society and even the man on the street can resolve to make this happen together.